Is it just me, or does the life of 1000 hrs at 30% capacitance change and the storage of 1000 hrs at 30% capacitance change seem like a very short amount of time? It's not great, but just to make sure you're not mis-reading that.. after 1000 hours at 2.5V in a 60Â°C environment, it lost at most 30% of its capacitance. You should get much better performance at room temperature and below the rated 2.5V. Note that the tolerance is also pretty broad.. -20% to +80%, itself. If you need a more accurate and stable capacitance, these probably shouldn't be your first choice :) If you just want to use them as intended - as a reasonably reliable power source that charges up in no time and can then keep a system running (e.g. a microcontroller + some sensors in standby) for a good while or just as an emergency back-up in intermittent power loss situations - it shouldn't be a problem. Placing these in series for 5V operation, as suggested in the description, should be done with care. The datasheet mentions -20%/+80% tolerance. Worst case this would mean one capacitor would get 3.5V (!) and the other 1.5V. Not a good idea. The differences will probably not that big, especially when you have two capacitors from the same production batch, but note that any difference in capacitance will cause a higher than 2.5V on one of the capacitors. 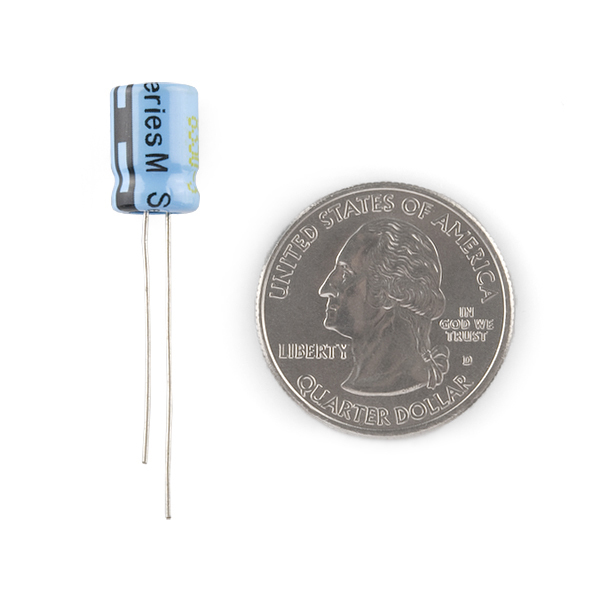 Is there a problem if we charge this super capacitor to 2.7V? 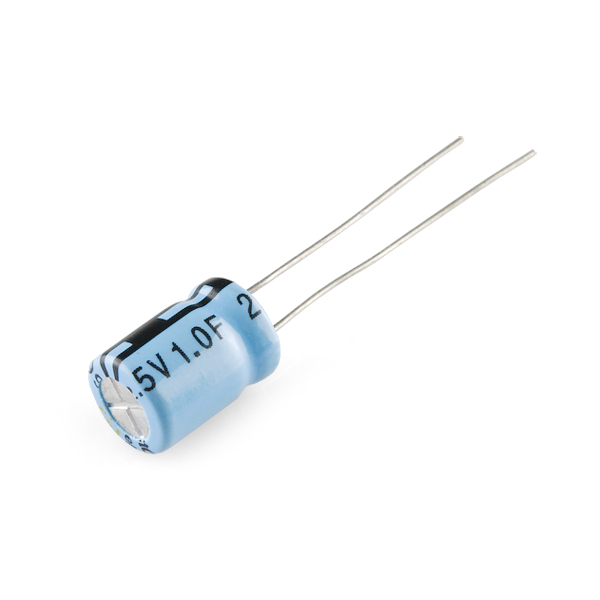 I am using a 2.7V Zener diode so the output is a little bit higher than the operating voltage of this super capacitor. 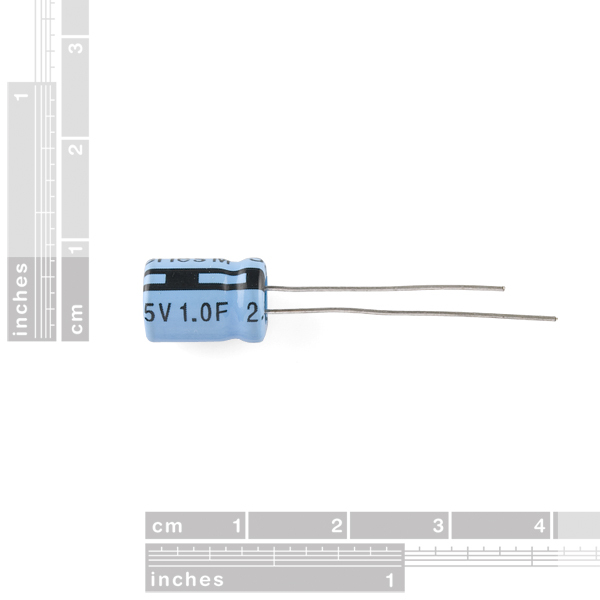 yes, 2.5V is the absolute maximum. It might work to put a diode in series with the capacitor's charge path to drop the voltage a little bit. You could probably find a Schottky diode with the right forward voltage drop pretty easily. This does mean, of course, that whatever's being powered by the capacitor has to be able to run off of 2.5 V (and even lessâcapacitors do not maintain voltage at all while discharging). Replaced two SUPER Capacitors, with two COM-10068 in an MTH SD70ACE HO Scale Locomotive, worked perfectly. The locomotive now retains all memory settings for sound and cab number. Will be ordering more soon! Any schematics of this be charged by solar cells and providing power to a microcontroller? What kind of discharge rate do you get on these? Can you discharge it through a single copper strand from a single conductor from a mains power cable and have the strand glow red hot? If so, I'LL TAKE SIX!! If the strand is fine enough, sure. The ESR is ~0.1 ohm, so to couple well to the wire, the wire will need to have higher resistance than that. And it stores ~4 joules energy, so to glow red-hot you'll need a pretty low-mass wire (0.39 J/gK for copper, so you have about 10 gK to work with to get your temperature rise of around 650 K). Happily for you, both of these restrictions point towards using as fine a copper strand as you can find. 40 gauge or finer, it looks like. I think vacuum-cleaner mains cables tend to be made of fairly fine stranded wire, though maybe not as fine as 40ga. If you put backslashes before those asterisks, they'll show up correctly.